I know its getting a little bit old, but after our side trip to Skardu I once again was struck with a bout of traveller's diarrhea. With a quick disolve immodium I made it through the three hour mini-van ride to the town of Karimabad, then I basically didn't move for the next three days (other than back and forth between my bed and the toilet). Did you know that the large intestine has a volume of up to 8L? Do you know how many trips to the bathroom it takes to evacuate 8L from your body? Alot. A whole shitload in fact. Do you know how NOT delicious the 'tangy orange' W.H.O. recommended formula rehydration salts taste? Very NOT delicious. I was supposed to be drinking 2-4L of the vile mixture every day but I could barely swallow a mouthful, not only is it NOT delicious it isn't TANGY either. It took our second-tier antibiotics to settle my stomach, I've probably built up a resistance to the milder ones. 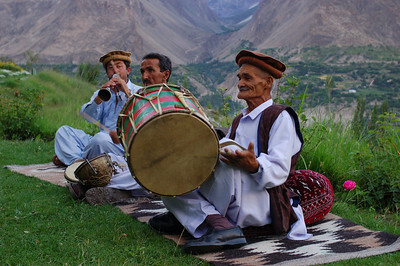 Meanwhile, Yann was taking advantage of the beautiful weather, scenery and communal home-cooked dinners at the lovely Old Hunza Inn. Towering above the town is the beautifully restored 800 year old Baltit Fort, and towering above the fort are the huge 7000m+ Ultar, Diran and Rakaposhi snow capped mountains. 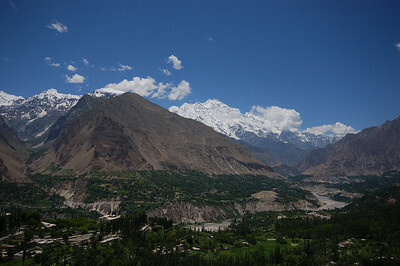 Karimabad, like most of the Hunza Valley towns is Ismaili. Ismailiism is a breakaway Shia sect, whose current spiritual leader, the Aga Khan seems to have a more moderate take on Islam (the town is actually named after the current Aga Khan, Karim Hussayni). 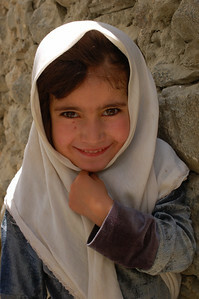 Women in the town are not usually veiled and are more colourfully dressed than their Shia and Sunni counterparts. For tourists, it makes for more open conversation and relaxed atmosphere. The town is a real traveller's hub. Yann was sporting his shaggy 4-month old beard and was getting frequent Taliban jokes from locals. Ismaili men don't wear too much facial hair, and if they do they keep it GROOMED. One man even told Yann that he really didn't like his beard. I got in the habit of calling him Yann Walker Lindh. In my first journey out of our room we stumbled upon a TV crew filming a show about the region for Pakistan TV1. They were very happy to have us in the show and attempted to get us to dance with the locals. I felt a little bit embarassed that the crew seemed more interested in filming our reactions than filming the local dancers and musicians actually putting on the show. When I started feeling even better I was able to sample a slice of divine local walnut cake and climb up to the Baltit Fort. We resisted We enjoyed a guided tour with the price of our admission ticket and Pakistani tourists (Western dressed) took turns posing with Yann who was clad in his shalwar kameez and wool hat (more Taliban jokes exchanged to my delight). On my second day of recovery we walked down to the neighbouring village of Ganish. It is a small village with a few dozen families, but they are the proud recipients of a UNESCO heritage award for the restoration and preservation of their small wooden family owned mosques. Hundreds of years old, they are covered with intricate carvings and are still used for prayer by the families to whom they are passed down from generation to generation. At the entrance of the town there is a large water tank filled every summer. Summer holidays were in full swing and children were running in and out of the tank. But noticeably absent from the crowd of young swimmers were little girls, who don't seem to enjoy the same "fun priveleges" as their brothers. 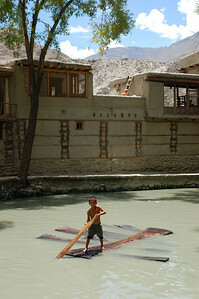 We could have stayed in Karimabad for weeks it was such a pleasant place. But there was just too much buzz about the upcoming Shandur Pass polo festival and we decided we couldn't miss out on it, even though it involved heading back to Gilgit and then continuing another 8-10 hours to the Shandur Pass. We enjoyed one last day of fine weather, scenery and food before beginning our journey to see our first ever polo match.